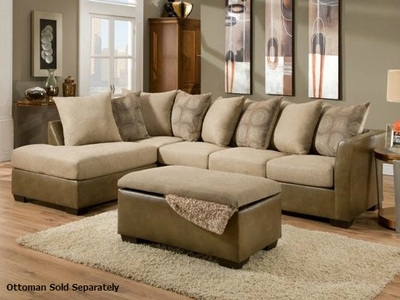 This Simmons Upholstery sectional sofa excludes the ultimate in plush comfort. Not only will this piece be a fashionable addition to your living room your guest will relax in comfort. The two-tone upholstery offers rich warm tones that are sure to complement your decor. Plush pillows contrast with the sleek flared arms and upholstered base, finished with modern block feet. Large enough for many guests and family members to enjoy.